Do you want to become a Highly Successful Entrepreneur, running your own show and earning at least $250,000 to $1 million per year? If so, you’ll need a HUGE EDGE because becoming a Highly Successful Entrepreneur certainly isn’t the norm. The good news is that my new eBook, How to Become a Highly Successful Entrepreneur, will give you that EDGE. There is nothing like it in the whole world. Let me tell you more about that in this brand new 5 minute video. You see, almost all entrepreneurs lack that hard-to-come-by edge so, of the roughly 600,000 Americans, each year, who go beyond dreaming of becoming an entrepreneur to actually successfully starting a venture, only about 3% (three percent) of them actually become Highly Successful Entrepreneurs. People in the know say that my book is uniquely capable of guiding you through to becoming one of that 3%, a Highly Successful Entrepreneur. 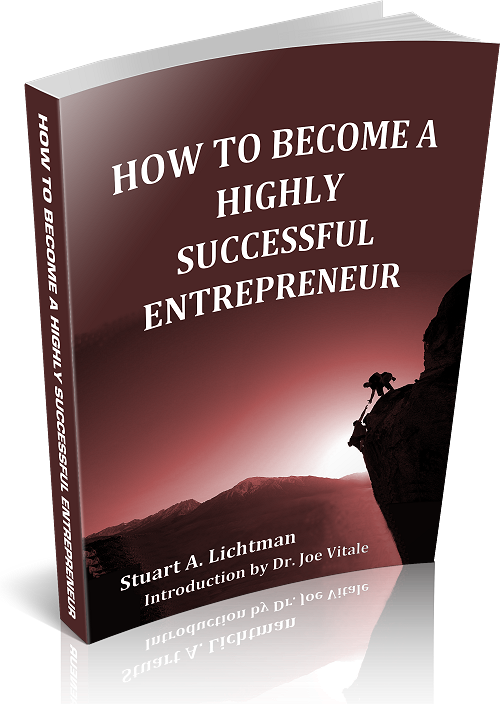 “The first aspect of greatest value Lichtman’s book will bring to aspiring entrepreneurs is that it leads them, in very concrete fashion, to think through all of the elements required to make a venture successful. This is key because very many startup entrepreneurs lack an understanding of such key aspects as how to sell and to actually get adequately paid for what they’re delivering. This book shows them how to do this and the other key aspects involved in becoming successful. The second aspect of greatest value this book brings to the table is that it shows the entrepreneur how to recognize, profit from and move on from the mistakes they will inevitably make. That’s key because most entrepreneurs are almost afraid of admitting and recognizing a mistake yet recognizing the mistake the critical first step in fixing the mistake before it severely impacts their venture. – W. Denman Van Ness, Managing Director of CIBC Capital Partners, General Partner of Olympic Venture Partners II, General Partner of Rainier Venture Partners and General Partner of the Venture Capital Group at Hambrecht & Quist. Venture Capitalists and Highly Successful Entrepreneurs point out that my eBook is the closest thing to a live mentor that you can have on your computer, tablet and/or smart phone. – Ramin Shamshiri, a Founding Partner of Commune, the highly successful Los Angeles-based design firm with a worldwide blue-chip list of clients. The bottom line is that If you want to become a Highly Successful Entrepreneur, what I describe in my groundbreaking eBook will extremely effectively lead you through the process of becoming one. If you want to have the keys to becoming a highly successful entrepreneur in your pocket, read this book and put its solid and innovative ideas to work for you. My new eBook is filled with innovative, absolutely unique and incredibly effective insights and proven techniques. Start now by reading through my eBook’s Annotated Table of Contents (below) and you’ll get a good understanding of the many unique aspects of my pivotal eBook… And of what it takes to become a Highly Successful Entrepreneur. You’ll see how, in step-by-step fashion, I will teach you what you need to do to become a Highly Successful Entrepreneur AND how to accomplish that. To support your process, I include in my eBook many tools from my first eBook system, How to Get Lots of Money for Anything – Fast, my Dream Achiever Program and my Super Achiever Coaching Program to concretely assist you.